Man what a busy week. I just finished up my last class and we produced a 6 minute 3D stereoscopic ride film called “Zombie Aparkalypse” Yes that’s an intentional misspelling. Notice the word PARK in apocalypse. 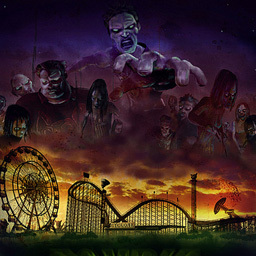 Its a five minute continuous camera move through a theme park over run with zombie hordes. Its funny and twisted and a lot of fun. I will be posting a 3D + 2D version on Vimeo this week and will update here. The best part was Stereo-D the 3D stereoscopic conversion company and its CEO Arron Parry and co-owner actor Giovanni Ribisi were on hand to interview our class, and offered 18 of them jobs working on the stereoscopic versions of “The Avengers” and “Thor” Way to go guys! I’m very proud of my September 2010 class! WOW! Thats great. Are the 18 going to be interning in hollywood with him? Well, yes they are going to be working with him, but they are not interning. All 18 were offered staff job with benefits. A rarity in today’s vfx landscape. Congrats, man! How long is the job they’re doing?